Whether you want to gorge yourself at the World Chili Eating Championship, hear Margaret Atwood read from her classic novel "The Handmaid's Tale," or battle it out with the Quizmaster of Georgia Avenue, D.C.'s fall festivals offer a chance to experience D.C. culture at its finest. For the secret foodie, bookworm and art connoisseur in all of us, check out this round-up of the best of D.C.’s fall festivals. 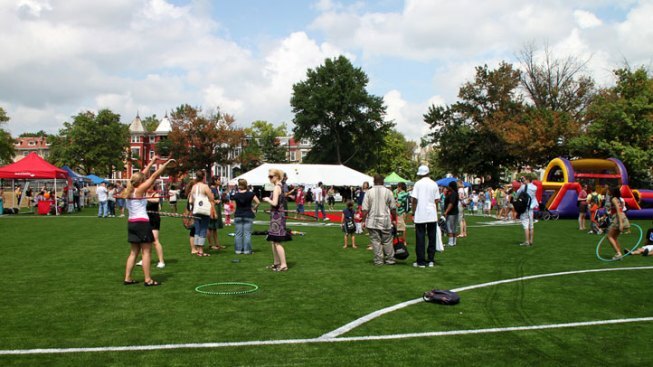 When: Saturday, Sept. 21, noon to 6 p.m.
One of the most popular neighborhood festivals in D.C. is coming back with a bang. The H Street Festival hosts an array of live performances, international cuisine, art exhibitions (including art cars! ), a tattoo contest and the newest addition: a fashion show. The festival will feature more 50 local artists and 80 performances on 10 stages. The annual National Book Festival is every lit nerd's dream come true. Thousands flock to the festival every year to see the guest authors, poets and illustrators for book signings and readings. Children are also provided a family-friendly zone for literature-centric activities. Notable authors this year include Margaret Atwood ("A Handmaid's Tale"), Khaled Hosseini ("The Kite Runner") and children's fantasy author Tamora Pierce. The third annual Southwest D.C. Arts Festival, nicknamed SW ArtsFest, is a fairly new fall festival that celebrates local artists and vendors in the D.C. area. SW ArtsFest is more family-friendly than avant-garde, featuring a film festival, a jazz festival, folk concerts and a sock-monkey art studio. The third (e)merge art fair connects artists from all over the world with collectors, curators and cultural decision makers in D.C. Participating galleries set up in rooms on designated floors while works by unrepresented artists are displayed throughout the hotel's public areas. When: Saturday, Oct. 5, 10 a.m. to 6 p.m.
Columbia Heights Day celebrates its seventh year with a showcase of Latin music, plus everything from yoga workshops and food vendors, to dance groups and rock schools. Other entertainment includes a D.C. trivia contest with the Quizmaster of Georgia Avenue and an performance from the GALA Hispanic Theatre. For the foodie in all of us, there’s Taste of D.C., the three-day food, wine, beer and music festival which takes place on Pennsylvania Avenue NW on Columbus Day weekend. More than 70 local restaurants and food trucks participate in the culinary bonanza, alongside about 35 musical performances. Be sure to check out the famous World Chili Eating Championship, which originated at this festival. When: Oct. 19 to Oct. 20, 11 a.m. to 6 p.m. and 10 a.m. to 5 p.m.
More than 180 artists participate in Bethesda’s annual fall arts festival, which turns the street into a outdoor art gallery. In addition to the traditional painters and sculptors, the Bethesda Row Arts Festival also features street performers, musicians and an arts and crafts area for children. Proceeds from a charity art sale also goes to local children’s charities. A followup to the popular Capital Fringe Fest, the Fall Fringe Festival brings selected favorites from this past summer's performing arts festival to D.C. audiences one more time. The cutting-edge cultural festival showcases the most modern of today’s theater, dance, music, poetry and puppetry performances.